The expression “B-movie” generally gets tossed around pejoratively, but here’s the God’s honest truth: Good B-movies like Premium Rush may be a rarer breed than virtually any other kind of movie you could name. The term’s context in film history certainly applies to movies that were made quick and cheap, intended to serve as the back end of a double feature. But, in more recent years, it has come to be a shorthand for genre pictures of all kinds: low-budget horror, science-fiction, suspense, gritty crime dramas. Those movies can be a wonderful kind of junk food supplementing a balanced movie diet, yet the people who make them too often either don’t know or don’t care how to make their simple elements satisfying. That’s why David Koepp is such a minor cinematic treasure in his ability to harness those elements, as he has in quality genre fare as both writer (Spider-Man, Panic Room) and writer/director (The Trigger Effect, Stir of Echoes). And once again, with Premium Rush, he shows how clearly he understands the basic requirements of delivering the B-movie goods. Lean, stripped-down premise. Koepp casts Joseph Gordon-Levitt as Wilee, a New York City bike messenger and office-rejecting ex-law student who careens through Manhattan with a gleeful disregard for anything but getting from Point A to Point B is quickly as possible. And the plot follows his lead, putting something into his bag for a deadline-sensitive delivery—it’s fairly irrelevant exactly what that thing is, except that it’s extremely valuable—and turning the next 80 minutes into more or less one continuous breakneck chase/race against the clock. Gordon-Levitt is an amiable protagonist, but there’s not much he’s asked to do here that a dozen other actors couldn’t have done just as well. Koepp throws a floundering romance with fellow bike messenger Vanessa (Dania Ramirez) into the mix, but Wilee always seems far more enamored of his need for speed than his lady—and that’s OK.
A quality antagonist. Sometimes the B-movie villain is the hero’s own psychology; sometimes it’s a flesh-and-blood bad guy. Here it’s the latter, with Michael Shannon playing an NYPD detective named Monday with serious gambling debts and not much time to pay off his creditors—hence his eagerness to relieve young Wilee of his special envelope. Shannon (Take Shelter) has certainly gotten a lot of mileage out of both simmering menace and flat-out whack-a-do craziness, both of which he gets to show off here. He throws himself into full-throated cackles of lunacy, and more subtle forms of manipulation, all with evident glee. Simple but satisfying flourishes. For a writer, Koepp has a solid sense for how to keep a movie moving and find a visual style that accentuates his premise. Here, he zips upward for overhead shots tracing Wilee’s planned routes to his destination; he rockets along with the messengers through tight traffic. In his most effective recurring gimmick, he puts us inside Wilee’s head as the veteran cyclist plots which of a variety of options for slipping between cars is least likely to get him—or someone else—killed, or even when no such option exists. Koepp also gets the most out of turning a bicycle cop (Christopher Place) into a would-be Javert who keeps losing and relocating Wilee’s elusive trail. If there’s anything that trips Koepp up, it’s when he backtracks to fill in the gaps that provide some additional character information: what the mysterious money ticket represents for Vanessa’s roommate, Nima (Jamie Chung); how Monday came to be in such big trouble with such rough customers; even the initial moments of Wilee and Vanessa’s relationship. The reality is that all that stuff doesn’t matter; if anything, it’s just a way to temporarily fool an audience into thinking that it’s watching something besides a B-movie. It’s always clear, though, how much affection Koepp has for pure genre satisfaction, if nowhere else than in the movie-insider alias Monday chooses for himself. 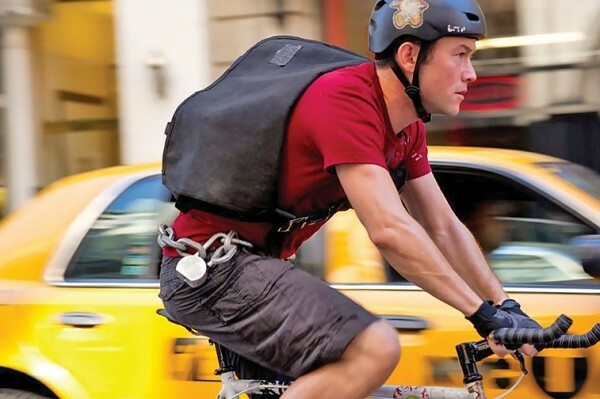 Premium Rush cuts through the nonsense of bloated spectacle to show how you can wrap an audience around your finger for 90 minutes. You keep the Oscar bait; I’ll keep the stuff that leaves you with a gasp and a giddy smile.